Colin Stowell. Photo via Heartland Fire & RescueColin Stowell was sworn in Monday as chief of the San Diego Fire-Rescue Department. 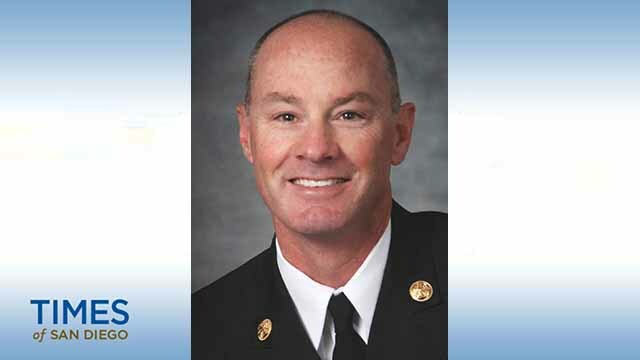 Following a national search that included interview panels with local firefighters, Mayor Kevin Faulconer decided a “familiar face” was the best choice to lead the department. “It’s critical that we have the very best people in the most important positions to keep our neighborhoods safe,” the mayor said during Stowell’s swearing-in ceremony. The City Council unanimously approved Stowell’s nomination on July 23. Stowell, the city’s 18th fire-rescue chief, succeeds Kevin Ester, who had served on an interim basis since April.